XL Tower is located at the gateway to Downtown Dubai, it has an ideal location and the infrastructure for the corporate houses,multi-national corporations to establish their headquarters. 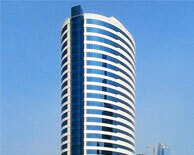 XL Tower sits on the water front, that has the views across the water to The Burj Khalifa. XL Tower is a beacon of modern elegance designed for commercial use, where professionals can enjoy their own space.